Interstate 270 in Maryland is a regional connector between the Capital Beltway (I-495) and I-70 at Frederick. A heavily traveled commuter route, I-270 joins Washington, D.C. with points west to Hagerstown and Cumberland and north into Pennsylvania. Just north of the Capital Beltway, I-270 splits into two branches. The main line angles east to link with I-495 by Chevy Chase. Interstate 270 Spur drops south to join I-270 with I-495 ahead of Cabin John and the American Legion Memorial Bridge across the Potomac River. North from the merge of I-270 and I-270 Spur, the freeway expands with four overall roadways. The Local / Express configuration extends north to Gaithersburg and Maryland 117 (Clopper Road) at Exit 10. The freeway for Interstate 270 was dually signed with U.S. 240, an intrastate route from Frederick, Maryland to Washington, DC. Interstate 70S was established along the route in 1956 and I-270 subsequently applied to what is now I-270 Spur. 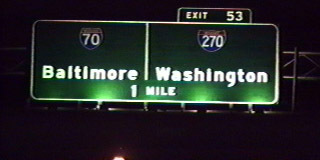 I-70 east to Baltimore was designated Interstate 70N. U.S. 240 was decommissioned in 1972. The split route for I-70 was eliminated the following year, adhering to the AASHTO mandate to renumber all suffixes routes within the Interstate Highway System. I-70N became I-70 and I-70S was renumbered as I-270. I-270 Spur was created in place of the short I-270 on the west leg connecting with the Capital Beltway. 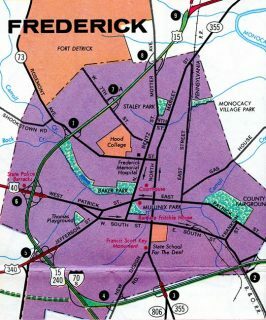 Interstate 70S defaulted onto U.S. 15 north in Frederick prior to the 1960s completion of the freeway west from Frederick to Hagerstown. Button copy signs preceding the split of I-70/270 eastbound previously referenced Interstate 70S. Vidcap taken 02/18/94. Traffic separates at the north end of I-270 into a two-lane ramp (Exit 32) for Interstate 70 and a two-lane continuation of the freeway to U.S. 40 west. Photo taken 08/04/13. Exit 32 branches away from the I-270 mainline for Interstate 70 & U.S. 40 east to Baltimore and a left merge onto I-70 west toward Hagerstown. Photo taken 08/04/13. Replaced with a small guide sign by 2012, an end shield for I-270 stands at the gore point where U.S. 40 merges from I-70 westbound. Photo taken by Tim Reichard (08/25/02). U.S. 15 and 340 combine along a freeway leading northeast to Frederick. U.S. 340 ends at I-70 (Exit 52B). I-270 splits with Interstate 70 east at the ensuing exit. Photo taken by Jeff Royston (06/10/06). Ramps from U.S. 15/340 north and MD 180 add two auxiliary lanes to Interstate 70 east to Exit 53 for I-270 south. Photo taken by Jeff Royston (06/10/06). Interstate 70 & U.S. 40 advance west from MD 355 (Market Street) south of Downtown Frederick to their split at I-270 (Exit 53). Photo taken 06/08/12. Interstate 270 north ends at I-70, with U.S. 40 overtaking the freeway north to U.S. 15 (Frederick Freeway) to Gettysburg, Pennsylvania. Photo taken 06/08/12. Exit 53A loops away from I-70 west to Interstate 270 south toward Gaithersburg, Rockville and Washington, DC. Photo taken 06/08/12. Interstate 270 north ends at I-70, with U.S. 40 overtaking the freeway north to U.S. 15 (Frederick Freeway) to Gettysburg, Pennsylvania. Photo taken by Tim Reichard (08/25/02). Interstate 270 concludes with ramps joining both the Capital Beltway east toward Silver Spring and Maryland 355 (Rockville Pike) south to Bethesda. Photo taken 08/04/13. One mile southeast of the wye interchange (Exit 35) separating I-270 north from I-495 west. Photo taken 12/30/12. Exit 34 departs just ahead of I-270 for Maryland 355 (Rockville Pike). The state route parallels I-270 to the east, serving the Rockville and Gaithersburg communities. Photo taken 12/30/12. Westbound I-495 (Capital Beltway) at Exit 34 for MD 355. 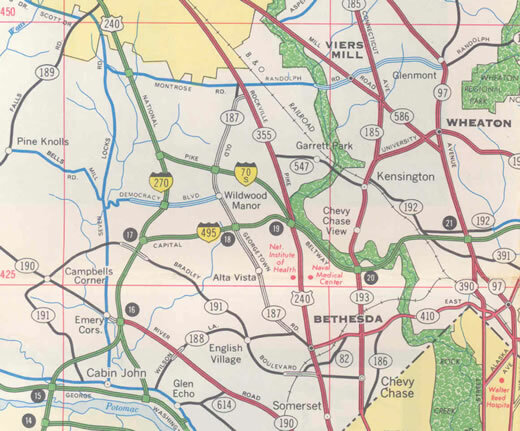 MD 355 follows the original course of U.S. 240, which was replaced by I-270 between Bethesda and Frederick. Photo taken 12/30/12. Traffic partitions for I-270 north to Frederick from the Capital Beltway westbound below the Rockville Pike overpasses. I-495 winds westward 2.5 miles to a wye interchange with I-270 Spur. Photo taken 12/30/12. Interstate 495 advances southwest to Northern Virginia while I-270 initially heads west to I-270 Spur and then northwest to Rockville and Frederick. Photo taken 12/30/12. Southbound on Interstate 270 at the split with Spur Interstate 270. This is the lone reference on guide signs for I-270 Spur. Photo taken by Jeff Royston (06/10/06). Interstate 495 splits with I-270 Spur 3.6 miles north of the American Legion Memorial Bridge spanning the Potomac River from Virginia. Photo taken 12/21/12. The Capital Beltway northbound widens to six lanes ahead of the separation with Interstate 270 Spur. The left lane is restricted to HOV-2 traffic. Photo taken 12/21/12. Interstate 270 Spur meets Democracy Boulevard by Westfield Montgomery Mall midway between the Capital Beltway and the merge with I-270 north. Interstate 270 expands to Local/Express roadways northward through the Rockville area. Photo taken 12/21/12. Guide signs for I-270 Spur reference the route as Interstate 270. Mileposts along the freeway however reference the spur extension. Photo taken 12/21/12. “State Highway Administration Celebrates Opening of I-270/MD 187 (Old Georgetown Road)/Rockledge Drive Interchange in Montgomery County.” Maryland Department of Transportation (MDOT), news release. November 4, 2003. Page updated June 8, 2018.